I had previously identified two broad usage-based segments in the smartphone industry, which helped us understand the trends shaping the market. Let's apply the same usage-based segmentation methodology to the tablet market to understand the current and future trends that could affect OEMs. Most industry watchers have (finally) come to the conclusion that smaller, low cost tablets are taking over the industry. This would seem counter intuitive to our previous smartphone analysis, which showed that larger screen devices and low cost devices catered to two different segments. The difference is that computing is the "default" use case for any tablet, across segments (as opposed to the computing vs. communication dichotomy we saw in smartphones). A better way to segment the market would be by specific computing use cases. Content "consumption" is a popular buzzword among analysts to describe tablet use cases. However, this categorization limits itself to a single segment of the tablet users and the products that cater to those users. The usage patterns here are along expected lines and similar to the "computing" segment of smartphone users, i.e. heavy social networking/email, messaging, browsing, gaming, etc. The key point to understand here is that most of today's tablets ranging from the 9.7" iPad to low-end 7-inch tablets cater to this segment. As products improved and the set of tasks performed remained the same, consumers naturally began gravitating to lower priced tablets. This was the primary reason behind the cannibalization and collapse of 9.7" iPad shipments. An argument could be made that 7-inch tablets were also easier to use, but I believe that was a secondary factor. Focusing on "consumption" as the only possible use case of a tablet is a very myopic view and distorts the ability to see the true potential of the tablet as a product category. 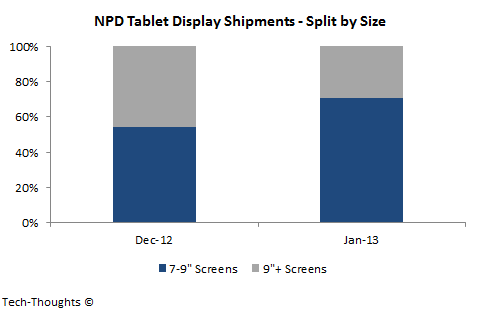 As OEMs improved "media consumption" tablets, rising competition has been pressuring margins. The next and most obvious move is to move upmarket to a more demanding set of customers, i.e. productivity as a computing need. Today, very few tablets are used for productivity (usually a hybrid tablet or an iPad with a keyboard accessory). Apart from Windows tablets (which face entirely different challenges), very few tablets are actually marketed as hybrid devices (in terms of form factor, not the operating system) which has limited uptake within this segment. Today, these customers use products like laptops or possibly, Chromebooks to accomplish these tasks (in publishing, education, etc.). This leaves an opening for cost-effective clamshell tablet devices to increase the size of this market. To the credit of OEMs, they seem to have recognized this as Android clamshell tablets are said to be on almost all product roadmaps (with more native keyboard features expected from Android 5.0). The segments here are slightly unique compared to the smartphone industry in the sense that there is no need to move customers upmarket. Most customers that require productivity are already using an alternative device. The challenge in this case is simply to upgrade productivity oriented customers from "media consumption" tablets to "lightweight productivity" tablets and therefore, replace the alternative productivity device.